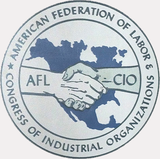 The American Federation of Labor-Congress of Industrial Organizations (AFL-CIO) is the US's largest labor union federation. According to Democratic Socialists of America member and journalist Harold Meyerson, the "progressive coalition" of labor unionists which ousted conservative AFL-CIO president Lane Kirkland in 1994-95 and replaced him with DSA member John Sweeney was led by Gerald McEntee, John Sweeney, Richard Trumka, and George Kourpias (all identified DSA affiliates). The coalition selected Trumka as Sweeney's running mate against Kirkland. Interestingly, this was 10 years after John Sweeney of the SEIU had led the “New Voice” team that replaced AFL-CIO head Lane Kirkland, successor to the anti-communist misleader and class collaborationist George Meaney. Sweeney had promised to move forward with an aggressive plan for organizing the unorganized and turning around a long-declining membership. AFL-CIO, Washington DC - Richard Trumka & Barbara Shailor. Mark Gruenberg of People's World reported that the endorsement of a Single-Payer health system was a result of the AFL-CIO Executive Council meeting from the 3-day meeting in late July at the George Meany Center in the Washington suburb of Silver Spring, Md. And there’s good news: More DSA members and alumni of DSA’s Youth Section are moving up through the administrative and organizing reaches of AFL-CIO international unions, and global labor solidarity groups, than ever in recent memory. Ohio Communist Party USA leader Wally Kaufman, used his position to mount a successful challenge to Cold War provisions in union constitutions barring Communists from holding office. Kaufman had been nominated to represent the retiree council on the executive committee of the North Shore AFL-CIO Federation of Labor, but said he could not accept due to the anti-Communist clause. This caused an uproar with protests being sent to AFL-CIO President John Sweeney At the following AFL-CIO Convention, the clause was quietly removed. The Painters and most other unions then followed suit removing similar provisions in their constitutions. AFL-CIO is listed on the March for Science website as a "partner." This page was last modified on 25 August 2018, at 23:38.